I am going to try a little something different this week by walking you through my morning on the river as it happened - so here goes! 5:08 AM - climb out of bed, get dressed, & round up last minute gear for the trip. I loaded the car with most of my fishing stuff and kayak the night before. It was warmer than I had expected. 5:45 AM - pick up Mary May. I could barely see her in her camo outfit. 6:18 AM - arrive at the launch. It is still dark. Meet Gary who loads me up with Deep Creek baits. My car will smell their like garlic scent for weeks. 6:40 AM - launch the yaks. The water feels pretty chilly on my feet. It is still rather dark. We begin heading down river. 6:45 AM - 2nd cast, 1st fish - a 2+ lb LMB that ate a Deep Creek creature bait rigged on a Carolina Custom Rod. Mmmm, yep, gonna be a good day! 7:15 AM - Gary gets on the board with his first bass then lands a chunky 19.5 incher that hit a Deep Creek bait. 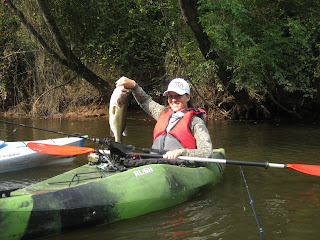 7:30 AM - Mary May boats her first fish - another fat LMB that hit a plastic worm. She gave the cheese face. Mary May's first bass of the day! 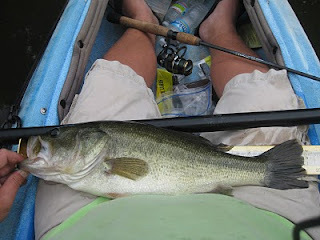 8:15 AM - I hook into a solid bass and reel in a 20.75", roughly 5 lb LMB on a plastic worm. This fish proceeded to give me the pseudo-cheese face. 9 AM - At this point we decide to turn around. Altogether we have landed about 10 bass with 2 over 4+ lbs and 2 more well over 3 lbs. 9:05 AM - 10 AM - We are landing 1.5 - 2.5 lb bass with general regularity - mainly on plastics. I lose a gar on a swimbait. Gary begins telling stories. 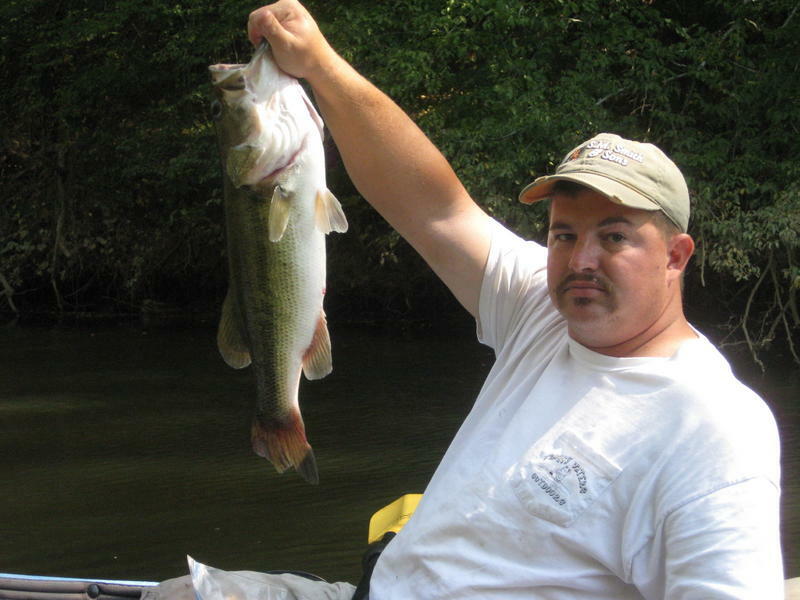 10:15 AM - Gary hooks into a nice bass on a Deep Creek bait and Scrounger head combo. He lands a healthy 20.75" fish. He even smiled for the picture! 10:30 AM - Mary May loses a couple fish on the way to the boat. One of them even splashes her on his return to the depths. She is sad. 10:45 AM - The bite is pretty decent, but it is getting warm and we were running out of energy. The chilly water is tempting me to take a dip. 11 AM - Gary gets a bite from a BIG bass. He breaches the surface and throws the bait. Weight estimate - well above 5 lbs. Mile radius from which Gary's scream was heard - well over 5 miles. 11:15 AM - I get a huge bite from a fish I first thought was a log. The fish wraps me up and I thought I lost him. The hook pops out and he hits the worm again! I miss him again...uuuggghhhh! Insert F-bomb here! 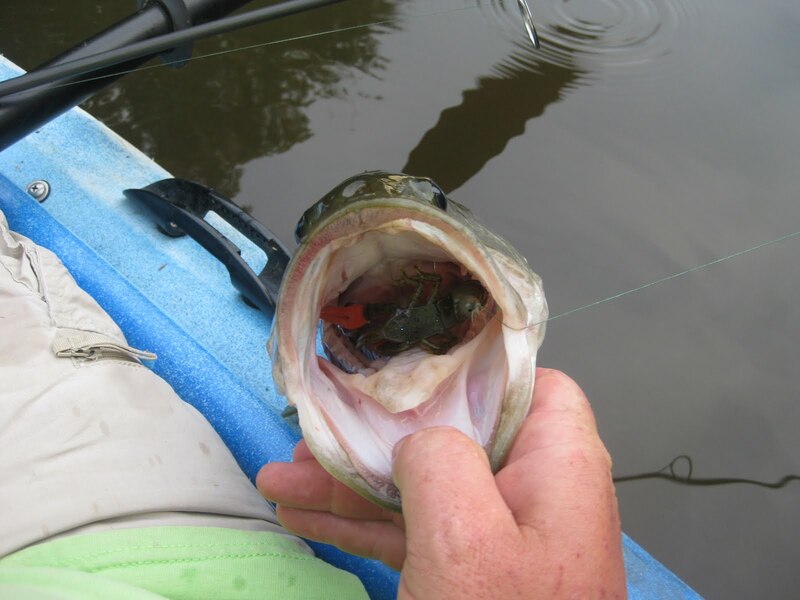 11:30 AM - The bite is pretty consistent with fish at every 3rd or 4th lay down including a few 2.5 - 3.5 lbers. 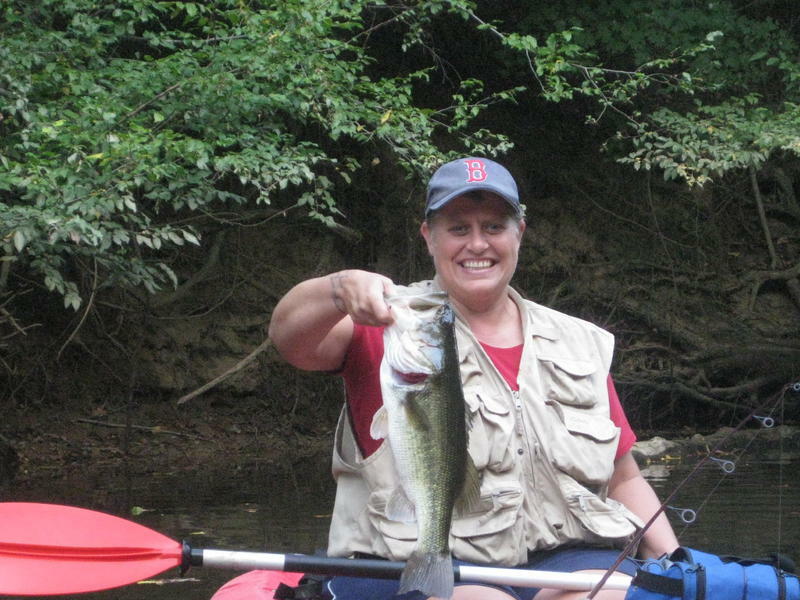 Mary May realizes that fishing in MA can't hold a candle to NC. 11:45 AM - One last fish to end the day - a chunky 2 lber that hit a plastic worm! Man...these fish pull hard! Noon - hit the launch, load up, and hit the road after a very fun and successful morning. The scenery, as it often is, was tough to beat! We caught fish on plastic worms, creature baits, scrounger heads, and chatterbaits. I was really happy with the way some new gear (a Daiwa Zillion HSA and Carolina Custom Rod) performed. We put a hurting on some bass and came away with some photos, sleigh rides, and smiles! Until next time, tight lines! This past Saturday, the Carolina Yakfish Series had it's 4th tournament of the year at Shearon Harris Reservoir. Shearon Harris (Harris for short) is famous for hydrilla, big fish, and feast or famine results. The tournament was set to launch from the Cross Point ramp on the south end of the lake, an area that had been good to me last November. However, early August and late November are much different times to chase bass, so I knew it would be challenging. I was able to practice a week before the tourney with my friend Santosh, the president of the Duke Bass Fishing Team. We fished from about 7:15 AM to 12:30 PM and did a fair amount of scouting. 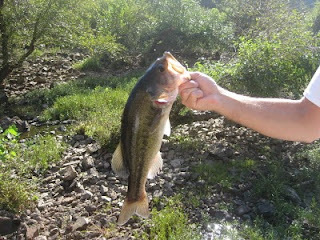 I lost one nice fish in the weeds, had about a 4 lber come unbuttoned at the boat, and landed a healthy 13.5" spotted bass - all in the same creek arm. All of these fish were caught on plastics fished over the hydrilla in 4-10 feet of water. Unfortunately, none of my favorite techniques were working, so my confidence level was not extremely high. 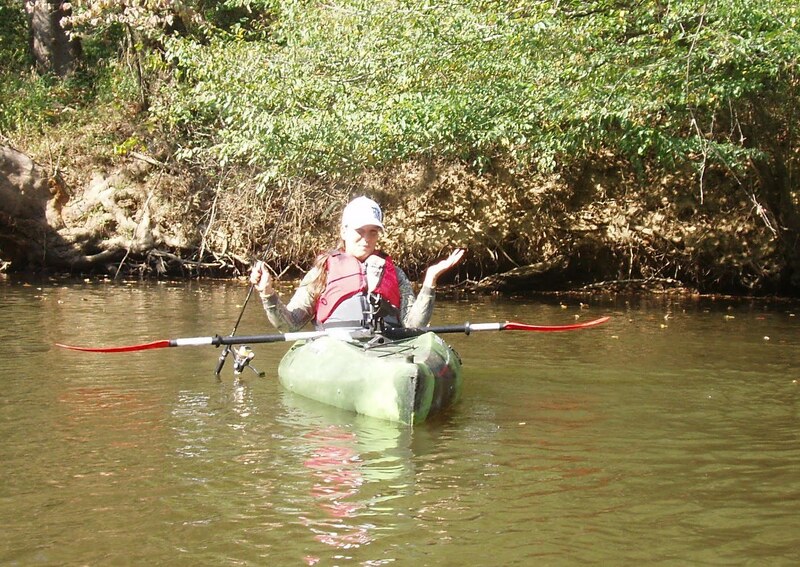 Regardless, I decided I was going to start my tournament in that creek. We gathered for the tourney a little before 7 AM and were on the water after a brief word from one of the tournament directors and a prayer. 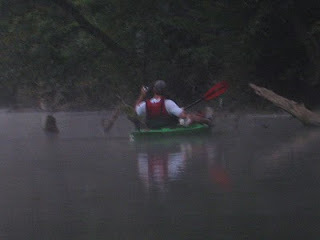 I headed for the creek and suprisingly only found 2-3 bass boats in there and no other kayakers. Within 5 minutes of casting I felt a characterstic thump of a bite and lifted my rod tip, but the fish wasn't there. I shook my worm again and felt the fish pick it back up. I set the hook....and missed the fish, who stole my worm to add insult to injury. Two casts later I got another bite on the edge of the weeds and thought things were really looking up. 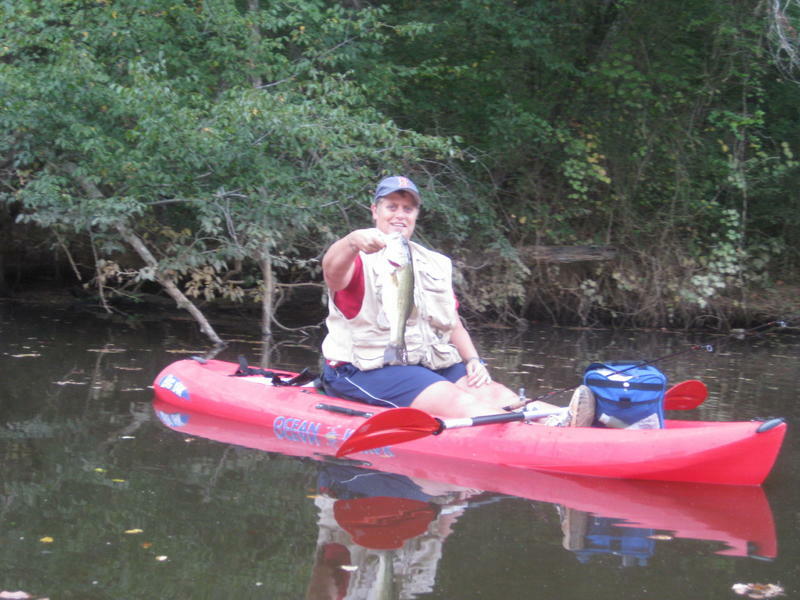 I fought and landed about a 17" pickerel, which would not help my cause. I then got to an area with a beaver dam, where I had caught the 4 lber the week before. Unfortunately, unlike my practice session when I saw 2 beavers who weren't very aggressive, this time there were 4 beavers who were slapping their tails on the water every 1 or 2 minutes and swimming all over. 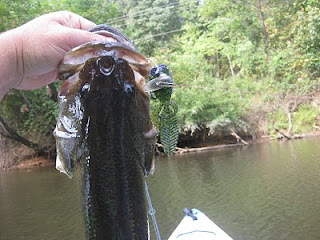 Needless to say, any bass nearby wanted nothing to do with them (or me) and I paddled to the next cove fairly quickly. There I landed my first bass of the day, a 10 3/4" fish that at least got me on the board. I landed a second pickerel, about 20" long, in the same cove. I then got a solid bite on the next point, but couldn't get a hook in the fish. In the next cove I landed my second bass, a monster 8 3/4" fish, and a 3rd pickerel. At that point, I would have gladly traded my 55" of pickerel for a couple nice bass! From then on it was all down hill. I got to a weedline that I really like and started fishing it hard. It had hydrilla and a lot of primrose and quickly dropped into 10 feet of water. I got what felt like a bite (I'm still not positive about it), set the hook, and the rod slipped in my hand. If it was a fish, he was gone. 5 minutes later I saw a small bass chasing shad, which were busting the surface. I went to heave my plastic worm toward them and it went sailing...unfortunately the force of the cast had torn it from the hook. By the time I grabbed another rod and threw it to the area, the fish was gone. 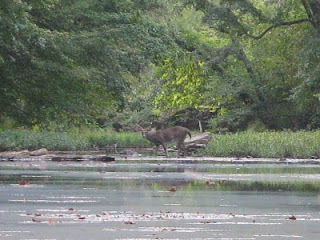 I continued fishing the weed edges with nothing to show for it. The water temp. was rising quickly and the fish seemed to be shutting down. Finally I saw a nice bass break the surface chasing baitfish on the other side of a cove. I reached behind me and pulled my crankbait rod from the rod holder. I wound up to make a long cast to the busting fish, brought the rod forward, and the lure didn't move. It had wrapped around the rod tip while behind me in the holder and I hadn't noticed. I tried shaking the bait free, but eventually had to unwrap it by hand. I made the long cast to where the fish had been, but 5 casts resulted in zero fish. I fished until about 11 AM in that creek arm with no more bites. So, I decided to move for deeper water and try my luck there. I was hearing reports from others that they were having really tough days, with lots of skunks (zero fish). This made me feel a little better, but certainly not comfortable with 19.5" in a big bass lake. Over the next two hours I fished carolina rigged plastics, texas rigged plastics, deep cranks, medium cranks, shallow cranks, spinnerbaits, and just about everything else I could throw...I just couldn't buy a bite. Finally I got to a stump in about 6 feet of water and got a good bite on a worm. I set the hook into a fish that felt big enough to put me in contention and possibly win the big bass pot. The fish made a deep run and was even giving ferocious head shakes. 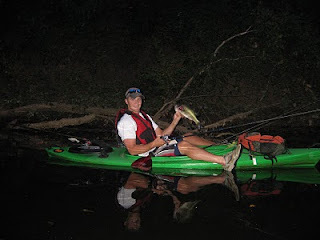 Then I saw him flash near the boat, and recognized the white belly of a catfish. Shortly after, I boated the 5-6+ lb channel cat. 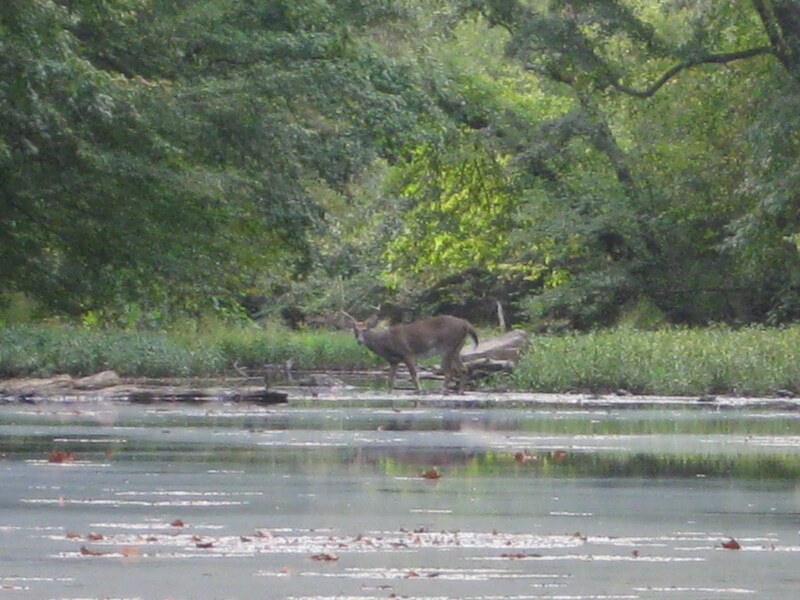 Finally, I decided to head back toward the creek arm and fished a smaller arm next to it. All of my bites had been around hydrilla, so I headed to the weed edge. After 15 minutes of fishing it hard I got a small bite. I set the hook, but couldn't hook up with the fish. I reeled in and checked my worm. In the process, I noticed that my hook was bent at a funny angle from when I had used my pliers to remove it from the hard cartiledge in the mouth of the catfish. I bent it back into shape, but wondered if it hadn't cost me a 3rd fish. I continued fishing until 2:30 with nothing more to show and headed for the launch with a whooping 19.5". As I pulled up to the launch, I noticed that lots of guys had already left. The day had apparently kicked everyone's butts. Out of 21 entrants (and a couple more 'fun fishermen'), only 9 managed to catch fish. As the lengths came in, I realized that my 2 little bass may actually place. Lots of good fishermen put zero's on the board. Somehow, despite what I considered a terrible day with some bad luck thrown in, I hung on for 3rd place. 1st place was taken by Scott Inge, who ran away with it on an early topwater bite. He caught 3 for 51" including the big bass at 20 1/4". Bob Dainton took second with 2 bass for 21". My third place finish was good enough to at least take home some cash and prizes as well as move me back to the top of the angler of the year standings. I caught every single one of my fish on plastic worms fished over the hydrilla. In hindsight, I probably should have fished topwater in the morning, but in practice it just wasn't working for me and I was getting bites on plastics (both during pratice and in the tourney) all morning long...just not the big bites that I know are there. 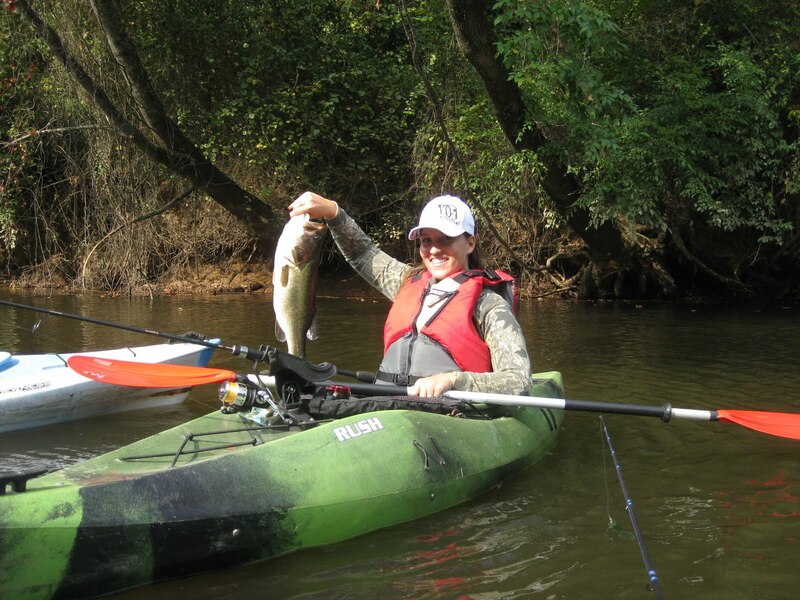 Check out the full results at the Carolina Yakfish website. This tourney was also my first as an official representative of Carolina Custom Rods. CCR is owned and operated by Brett Hinson from Chapel Hill. Although he is a Tar Heel fan, he makes up for it by making really nice, sensitive, light weight rods. He made me a custom, Duke themed baitcasting rod that is 7', split grip cork, spiral wrapped, & has microguides. 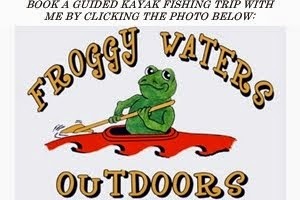 It really impressed me on the water and I will have a post up shortly with some pictures and a review. He also made me a deep cranking rod, which I can not wait to try out! If you are interested in a rod (and you should be), including saltwater rods, give Brett a call at (919) 240-5422 or email him at carolinacustomrods@nc.rr.com. It will all come down to the final event on Jordan Lake to determine the angler of the year. The best 3 finishes count toward AOY, which makes it a 4 horse race for the title. Counting all 5 tournamenst would benefit me more, so I really need to lay it all on the line. Thankfully, I have had a lot of success in the fall on Jordan (including winning the Inaugural Carolina Yakfish Tourney there last year), know some good areas, and can really fish to my strengths. Until next time, tight lines ;)!